In the first version you can launch scans manually from the console or schedule the Give PC A Flu Shot on a system or a group. The Send the Nurse Over script is just a worker script launched by the Give PC A Flu Shot, do not schedule or execute this script alone. (It just won’t do anything useful) Import the scripts, then using the plugin manage under the help menu of your LabTech console, you can upload the plugin and activate it. Make sure the scripts go to the correct folders in Labtech then start scanning systems. 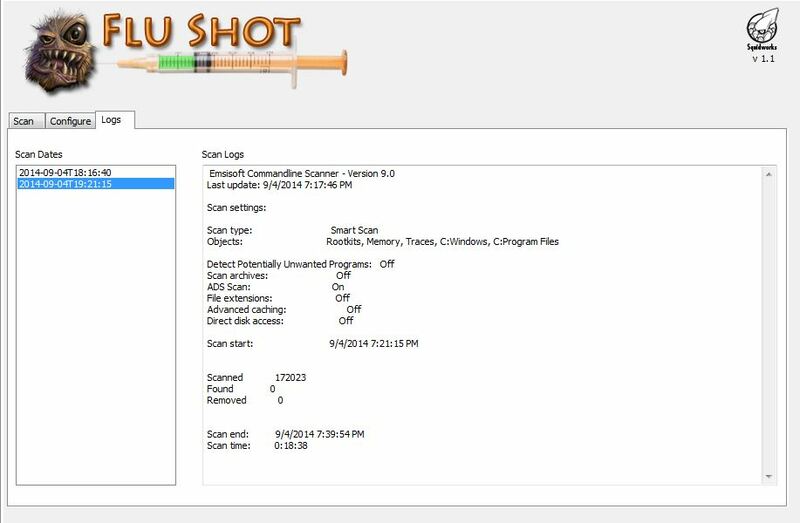 We now added the ability to setup custom scanning configs, selecting a system you can modify the scan policy for that system from the Flu Shot Tab. 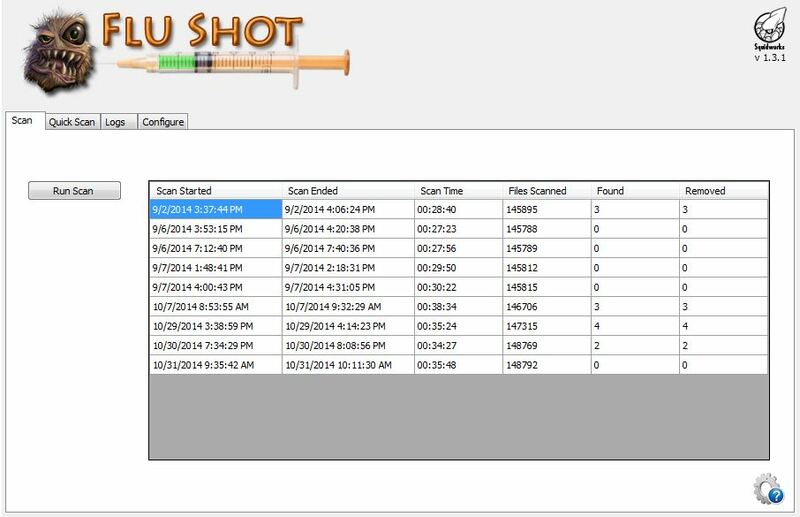 We also now save and display the actual log files from the scanner based on log time under the new Logs tab of the Flu Shot Plugin. Several bug fixes and improved scripts, Oh yea we also added in help documentation so you can get all the help you need with managing FluShot. We added a new Client Tab that provided a overview of the scan history for all computers the are under the client. We added the ability to export that view as a report in Excel. We added a few more nurse checks for long running scans and now do now force the download of the scanner if a local copy exists. This will prevent some of the download denials we have seen when a lot of systems scan at same time. We added a new sub tab for “Quick Scans” that will allow you to run a quick interactive scan and see the results in the terminal provided. We added UK time support to the Nurse collection scripts and corrected several issues in the scripts and console. Please comment here how it works for you so we know if we need to fix anything. Great work! Small issue I am having–logs do not get published. I can see the scan running, but ultimately the logs tab is empty. Error-> Object reference not set to an instance of an object. This pops up twice then goes aways. Go to the config tab and save a config? Does error stop? You also maybe missing tables that are not creating as they should. See if you have 3 tables for the plugin. You maybe missing 2 tables. Here is SQL to create missing tables. execute each SQL statement in SQLYlog on the LT server. For some odd reason the code is not being executed in the plugin correctly. I will look in to this in next release. Thanks you sir. Dead on…two tables did not create. I’m rocking and rolling now. Thanks for all your assistance and contributions. Any thoughts on not being to view the logs? Manny do you see entry in the Scan Tab? if so there should be a log for that scan. Some scans take hours to run and may cause the pickup script to time out before the system returns data. Retry running a scan, if a previous log file now exists we will process that file first then rescan system. You will then see (after processing) the older log scan dates and information. if its there do you see that the “Nurse” is still scheduled to run again in the scripts tab. If so it should pickup log file. if not we timed out some where. Send me all the script log history showing the entire scan process and Nurse script schedule and executions. I will look over logs and see what the script was doing and what was returned. I am not seeing the flushot config tab. the plugin is active and it shows under workstations. I can run scripts but they fail in line 11 (batch file) i am assuming there are configs i should make in the tab before this. Any thoughts on the tab? maybe im just looking in the wrong places. Does your version say 1.1 ? Just installed the plugin and it is showing as active in plugins but I do not see any evidence it is there under scripts or anywhere else. I checked and the (3) FluShot tables are there. Am I missing something? Flue shot should show up under each computer console in Labtech as A TAB. You should also have a flushot scripts folder with several scripts in it. 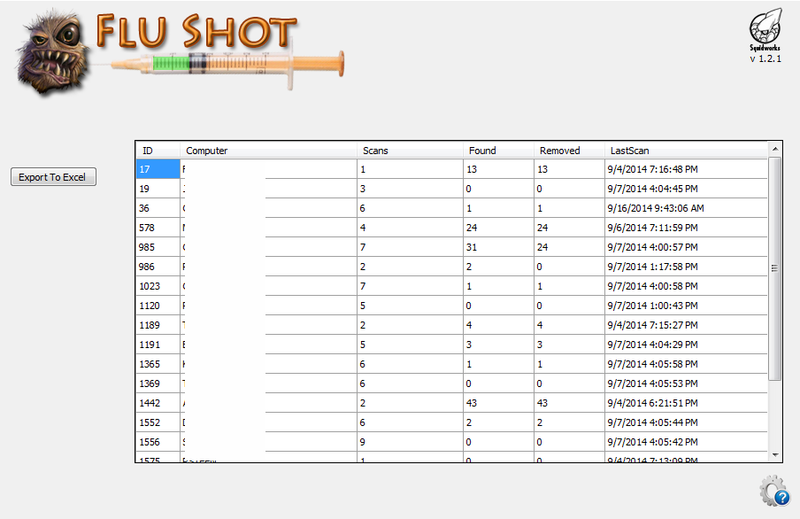 Try searching scripts fro “Give PC A FluShot”to see where LT imported scripts to. Then just move them to the correct folder. You may also need to restart the LT console after loading plugins. It some times needs a full refresh to load new plugins. Is there a place to setup a default scan config for all computers – or do I need to edit the script – seems line 99 is the place to do this. With Root kit and PUP and a few other minor settings but looking at code I see a bug. I forgot to add to the SQL insert the columns to update so line 99 fails for all . I am updating the script now to fix. Will release a new version in a day or so after testing. Is there a way to have it only report on what it finds and not quarantine or delete? We just launched a major version update, Version 1.3.1 is now available for download and adds several new features and bug fixes. UK time support is now added and a new interactive quick scan. Still not seeing logs, nor does the processes tab in LT show the exe running. Any tips? Flushot 1.3.1, Error -> there is no row at position 0. Do you have a resolution to this? Phil, if you run the quick scan does it produce an output? If so then relaunching main scan and allow it to complete, may take several hours based of files and system speed. Wait for the nurse to be scheduled as that script is the script that grabs the log files..
Can you verify all 3 exist? Love the plugin. IS there a way to include the scan results into a LT report or is there a report default that we can send to a client? We have a couple of Win7 Desktops crash to blue screen when FluShot runs. I have logs and information that I can send and not in the public domain. Having an issue when running this via LT. I keep getting “No log files found,” which means we don’t see a result. Any ideas or advice? THis is due to the fact that you are failing to see the 7za.exe file under your http:://ltserveraddress/labtech/transfer/software directory. Make sure to move any files like 7za.exe to the directories that the scripts are looking for the files in. I installed it, and got the object not defined error twice. I ran the two sql commands above, and now the error comes in only once. I think it is about the config table because the parameters dont save. I am using labtech 10 if that makes a difference. How do i enter this statement in my LT Server, kinda lost. Thank you for your great work !! – There is no option like (Clean Quarantine), so i created a simple script for that. just want to share this idea. Hi! I am having trouble getting the logs to produce properly after scanning a machine. I looked at the recommendation you gave above but it doesn’t seem to have helped, and I wasn’t able to find any log files. Any suggestions? space . Exploring in Yahoo I ultimately stumblled upon this website. Will this work with LT 10.5? Has anyone noticed that google chrome is crashing due to a scan on this. How can I exclude from being scanned. I have tried to go to that link for the download and it shows that it is an invalid link which may be the issue? That could be, that was an older plugin and so the location of software may no longer be present. As Jason mentioned a few months ago, chrome_elf.dll is detected as some sort of malware. Even after a clean install of Chrome. Is there a know issue, of way to exclude files? I keep getting Flushot license plugin error. Also, does not seem to be saving the config after click the checkboxes and selecting the drop downs. flu-shot script is removing my office16 Excel.exe . it is detecting it as ransomeware. Where is the configuration for the Scheduled script set? I can see the settings for individual devices in the FluShot tab but no where else can I find settings. Is the Plugin supposed to show in tools? Also it seems that http://dl.emsisoft.com/a2cmd.zip is no longer a valid download. are there any plans to update this in the plugin and or script?